In a small saucepan, add in the sugar and cornstarch. Whisk until combined. Add in the raspberries and water, whisking until combined. Bring the mixture up to a boil and let boil for 2 - 4 minutes until thickened. Be sure to mash the raspberries with the back of a wooden spoon while it's boiling. Place into a bowl, cover with plastic wrap and place in the fridge to chill. Cupcakes Preheat oven to 325 degrees. Place the cupcake liners into two cupcake pans. Set aside. In a large mixing bowl, add in the butter and granulated sugar. Mix until light and fluffy. Add in the vanilla extract, coconut extract and the eggs one at a time. Beat the egg into the mixture until thoroughly incorporated before adding the next egg. Scrape down the sides of the bowl and beat in any additional egg. Add the coconut cream into a dish and stir. This will help incorporate any liquid that has separated and loosen the cream up some. Add the flour and coconut cream alternately always starting and ending with the flour. I did 3 additions of flour and 2 additions of coconut cream. Scrape down the sides and mix to combine. Place the cupcakes into the oven and bake for 28 minutes or until done. Remove from the oven and let cool completely before adding the filling or frosting. In a large bowl, add in the butter, powdered sugar, milk, and coconut extract. Mix on medium until incorporated. Turn mixer on high and beat for another 1 - 2 minutes until light and fluffy. Add half of the frosting into a disposable bag fitted with a 1M tip. Using a small knife, cut a hole in the center of the cooled cupcakes. Make sure it doesn't go all the way through the cupcake though. Add the chilled raspberry filling in a disposable piping bag. 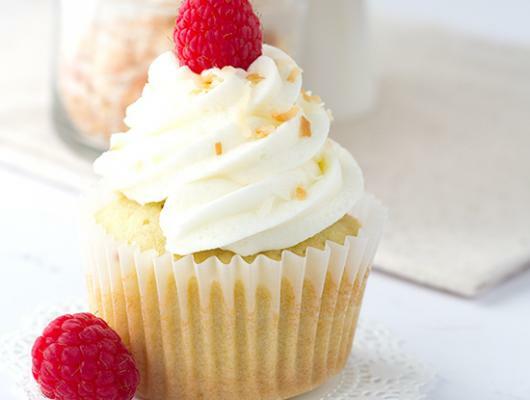 Fill each of the cupcakes to the top of the cupcake with the filling. Using the frosting in the piping bag, add a swirl to each cupcake. 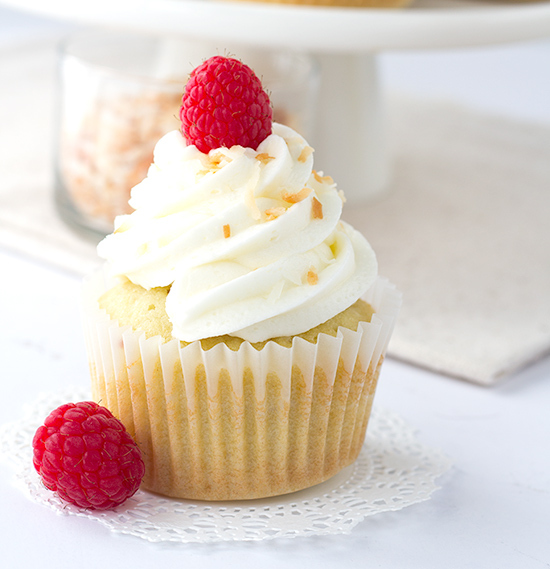 Add some toasted coconut to the top of each cupcake and top with fresh raspberry.